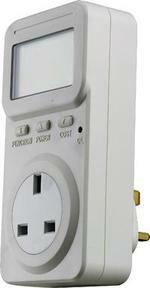 Buying electrical and electronic products with energy rating is the first smart move to make. Well done! Next, there are ways to trim just that extra bit of power when using these products, simply by the way we use them. With electric kettles, the first and perhaps obvious choice is to only boil as much water as required, as this takes less time. Less time means that the energy required is reduced. So don’t fill the kettle up, but halfway, if it’s just for a cup of tea for two. If you wish to cook food, then a 750W microwave oven will use far less electrical power than a full size electric oven. It will also be faster, therefore less energy is used to achieve the same cooked food. If you cook as much of the food required for any given meal using a microwave oven, then the total energy required is significantly reduced. With washing machines, we have a double approach – the type of soap used, and when the washing machine is used. Washing machines include electrical heaters, where these are used to heat the water supplied up to a temperature required by the cleaning soap. The higher the temperature required the more energy and thus more electrical power is used. With the introduction of lower temperature soap liquids, such as 15 degrees Celsius, this means that the electrical energy now required for heating the water is significantly reduced, providing faster washing, less electricity used, and money saved! Control use of appliances with a timer switch. The next challenge is what time of day to wash your clothing! This choice is dictated by how electricity is generated – industrial usage and demand account for heavy electrical loads during the working day. This means that the electricity generating stations are working near full capacity during the working day. At night, the industrial load reduces, but the electricity generating station cannot be switched off and needs a minimum load to work efficiently. This means that the early hours of the morning is the best time of the day to use domestic washing machines to be the equivalent of the industrial electrical load during the working day. To provide this arrangement, washing machines can be loaded with clothes, soap and timed to only operate during the early hours of the morning automatically. By the time you wake up, you have freshly washed clothes ready to be dried, ironed and so on. This is why, in the United Kingdom, cheaper rate electricity is offered to domestic users to encourage them to use electricity late at night and in the early hours of the morning. By washing clothes at night means that more clothes can be cleaned and less water is used. How can we enjoy watching movies at home without stressing our environment much? Avoid older televisions that use cathode ray tube screens and even plasma screen sets, as both consume considerable electrical energy. Instead, use liquid crystal display or LCD screens on more recent television receivers as they consume a lot less electrical energy to operate with. They are cheaper than plasma, and you know that you are doing your bid to keep energy usage down. There is also another option to consider, and that is using timer switches so that certain electrical appliances are only operating for a fixed period of time, and then switched off automatically. An excellent example is an electric blanket, where most people use to keep warm in bed. However, once the person is asleep and the bed is warmed up, a timer switch can be used to turn off the electric blanket. The picture on the electrical timer switch here can be used to switch electrical and/or electronic products on and off as set intervals over a 24hr period. 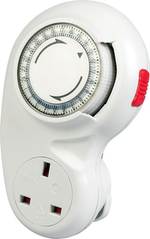 Similar timer switches are also available for seven day periods of switching, and so on. Finding out detailed information on electricity usage on domestic electrical and electronic products can be frustrating if labels are worn out. Knowing what is the highest consumer of electrical power is perhaps the top prize! For this purpose, it is possible to safely measure what consumes the most electrical energy by using a domestic power instrument. Be in the know with an Electrical Power Module. The picture shown here represents an Electrical Power Module that you simple plug directly into a domestic electrical outlet, then plug an electrical or electronic product into the Electrical Power Module, switch on, and it will show exactly how much power is being used and how long it is used. If you decide not to watch a movie, do not leave the television receiver on standby mode as this simply wastes electrical energy with no benefit. The same applies to video recorders (except to keep the clock working) and computers, as leaving electrical and/or electronic products switched on in standby mode just wastes energy. Remember, LCDs respond very rapidly when switched on and are significantly faster than the other early television receivers mentioned. Naturally, the same applies to other domestic electronic appliances, such as stereo audio systems, as standby is not necessary! Long gone are the days when Thermionic Valves were used for domestic electronic products - those that required several minutes to warm up before becoming functional.